“Why do they call this the Holy Hill?” I asked as we reached the base of the trail, nothing around us but pine trees and the heavy quiet of snow. 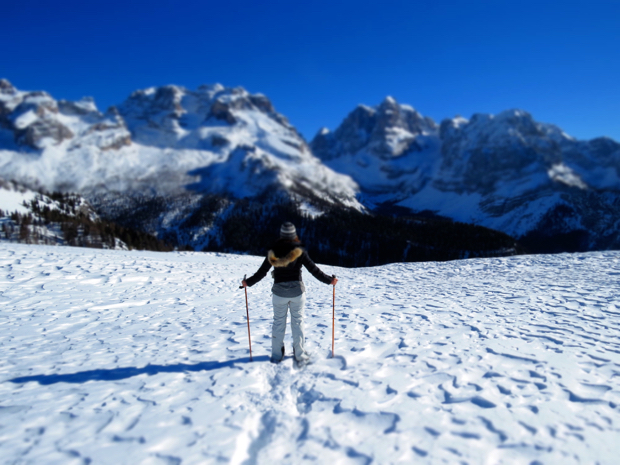 I stepped forward, sinking slightly into the deep white, my snowshoes keeping me afloat. I reflected back to the day before, when Kirsi and I met in the woods near the Russian Border. 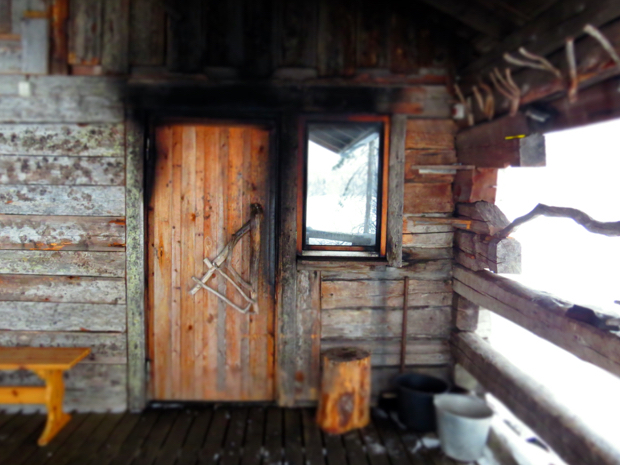 I had spent the night in a family owned lodge, Isokenkaisten Klubi, run by daughters Sirpa and Katja, built by their father Aimo’s own hands. In the homey upstairs guest room, I felt like I had gone to a relative’s house for the weekend. I didn’t realize how much my traveling spirit craved being swaddled like that, until I found myself suddenly in its embrace. When I saw Kirsi’s glowing smile that afternoon, I knew I had met a kindred spirit. As we walked the trail that led from the cabin into the woods, Kirsi and I spoke about our shared reverence for nature. She expressed her passion for Seasonal Yoga, a practice of living in harmony with the cycle of nature. “Winter reminds us to rest. 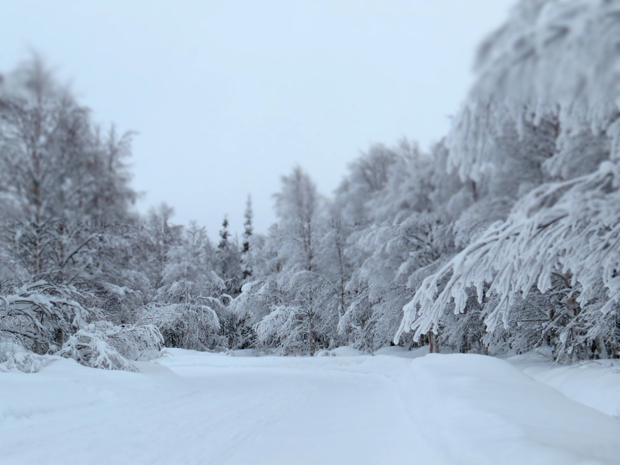 The snow covers the trees, putting them in hibernation until the Spring. Similarly we must allow ourselves to slow down and conserve our energy during this time,” Kirsi explained. I thought about how I’ve been chasing summer since I started traveling three years ago. 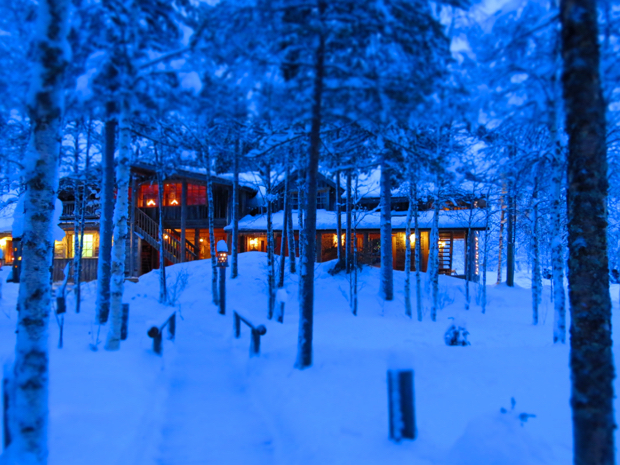 And even now in winter, in Finland, I was working nonstop, rarely allowing myself any rest at all. 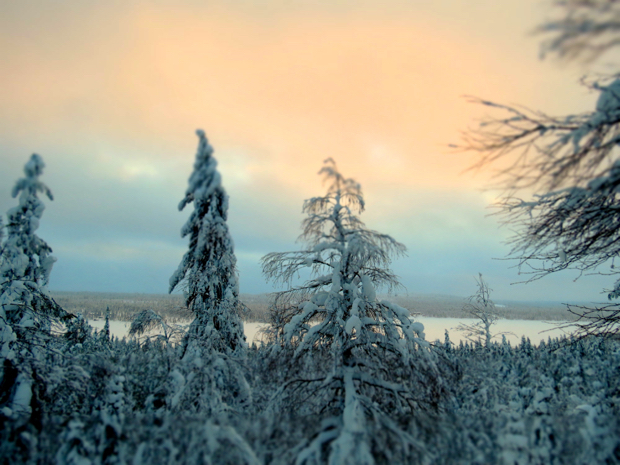 “Is it strange to chant a Native American song in the snow in Lapland?” I wondered. 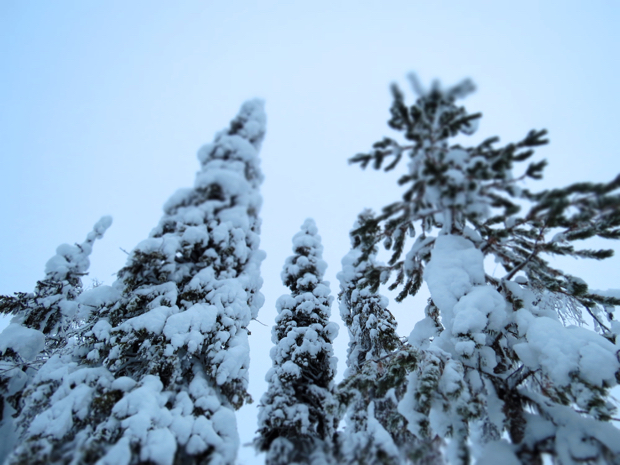 We ended at the deck overlooking a vast frozen lake, a sheet of white against a sea of gray pines. Aimo emerged from a wooden door, covered in soot. 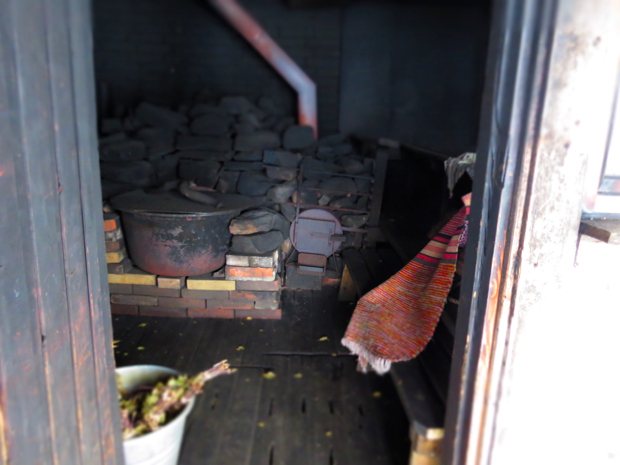 He had spent the day tending the fire and preparing the coals for my and Kirsi’s smoke sauna that evening. 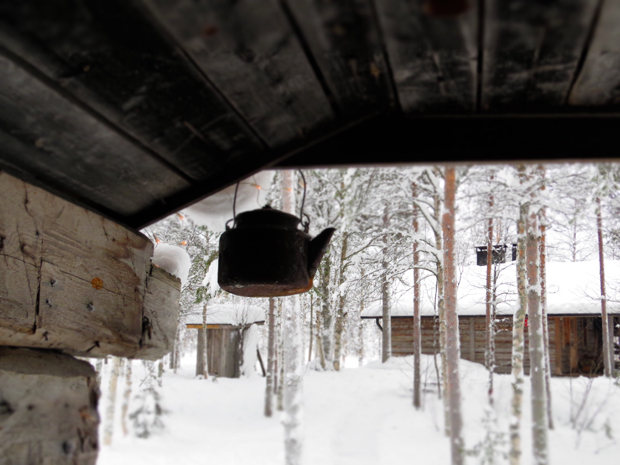 A laborious task that ensured us the most traditional sauna experience still practiced in Finland. Kirsi and I entered the dressing room and sat on the reindeer hides beside the fire. I sunk my fingers into the deep tufts of hair, amazed at the softness and strength of the fur. 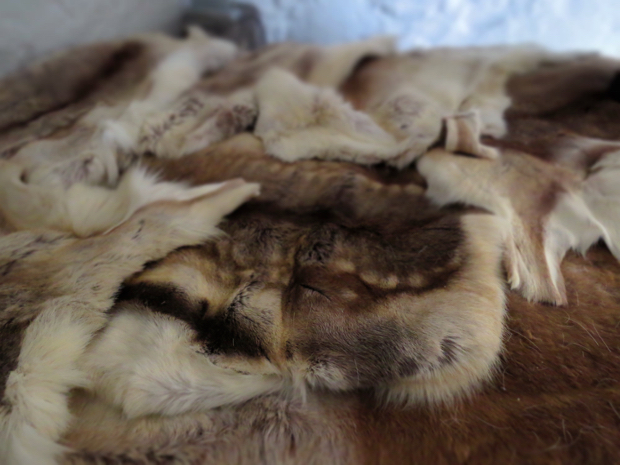 Typically animal skins make me feel uncomfortable, guilty even. In the past I’ve thought they represented man’s desire to have domain over the animal kingdom. Killing something that doesn’t belong to him and displaying it like a trophy. 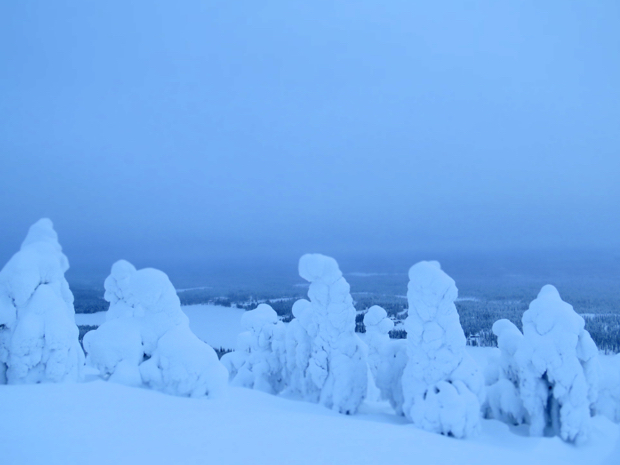 But I felt differently here in Lapland. Reindeer are not disrespected nor seen as beings to conquer. Rather they are seen to offer the greatest gift of all: life. 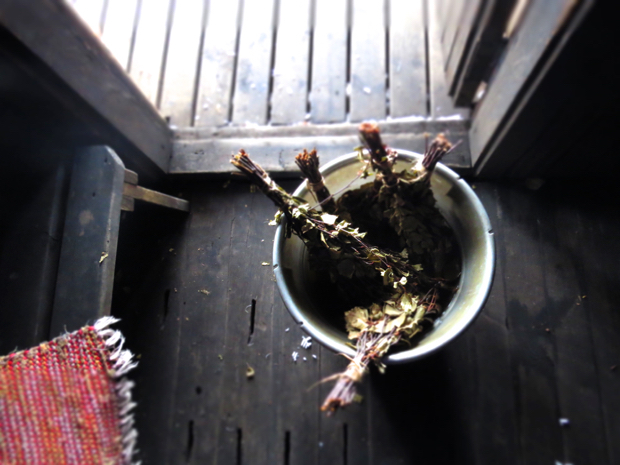 Sirpa prepared us a pot of tea made from wild herbs she gathered in the woods during the summer. The blend included plants I had never heard of, along with strawberry stems, nettles, and rosemary. I took a sip. Heaven. I felt like a honeybee tasting a flower’s nectar for the first time. 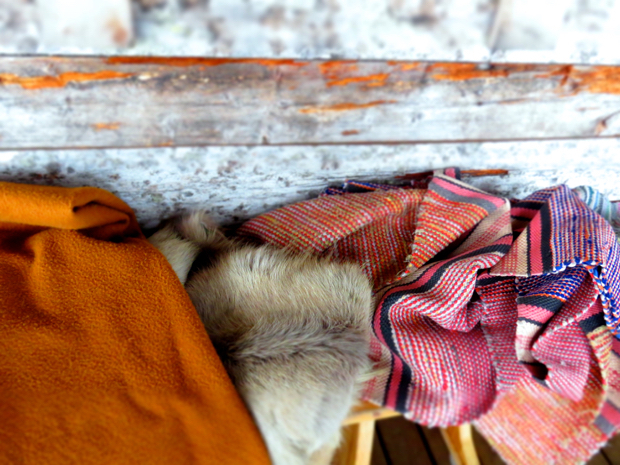 I set down the tea, reclined on the reindeer hide, and closed my eyes. Kirsi instructed me to breathe into my belly, into my ribs, and up into my heart. Then release from my heart, from my ribs, from my belly. I’ve taught this breath technique many times in my own yoga classes, in Costa Rica, likening the movement of breath to the movement of a wave. Here, in the snow, I imagined it as simply energy. I felt my body grow heavy, melting so deeply into the hide I wondered if I could lift a limb if I tried. Simultaneously, I felt a strong activation in my chest. A tingling sensation. Like an opening. She suggested I envision my favorite place in nature. 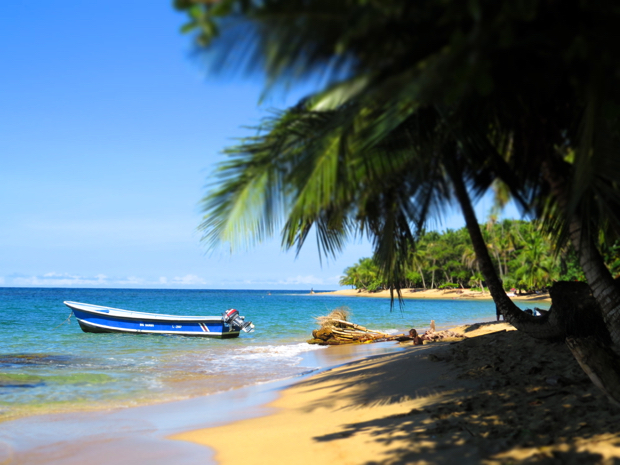 I saw Punta Uva, my home in Costa Rica. I saw my favorite palm tree. I lay against it, I hugged it, and I sprawled on the sand beneath it. Then I slowly watched it drift away; its image replaced by the woods where Kirsi and I had just hiked. I saw the trees, heavy with snow. I heard the silence. Kirsi began to strike the Lappish drum, a tradition used by the Sami people to connect with the wisdom of nature. My mind wandered and I practiced keeping it still. Chatter remained inevitable, but I had moments of connectedness. In one of those moments, I saw a bear. He stood above a bonfire, in the darkness, wearing a Native American headdress. He seemed to be performing a ceremony. My mind flitted between future planning, sources of stress, and my anxious grasping desires. I brought it back to my breath. Then the bear returned in different forms. In Siberia the word for a woman shaman is the same as the word for bear. Similarly, in Native American tradition, the bear as a spirit animal represents the energy of the woman healer. In many ancient beliefs, the bear symbolizes great power and healing abilities, while its presence reminds us to take rest for ourselves. 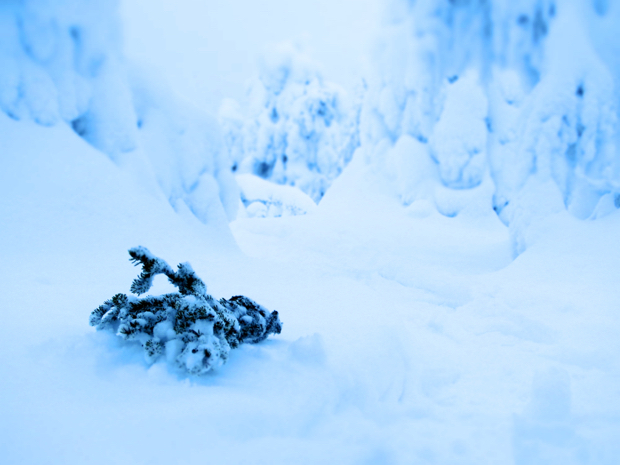 In the winter in Lapland the bear hibernates, recharging for the days of endless sunshine ahead. I remained conscious and tried not to attach nor prescribe meaning to what I saw. A difficult task indeed. 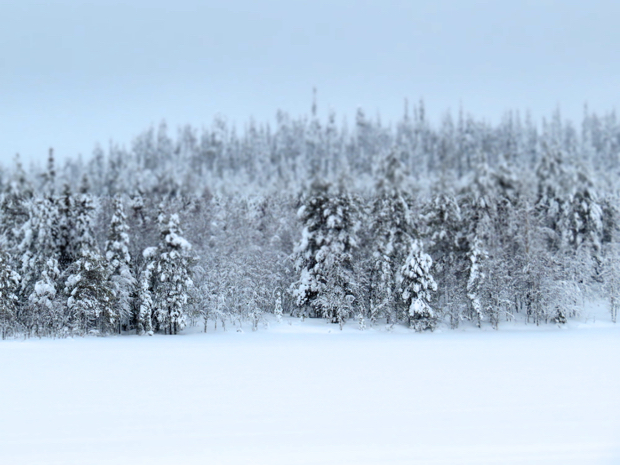 Eventually came the crocodile, bizarrely out of place in the winter landscape of Lapland. This was hardly the first time the crocodile had come to me. I’ve had many encounters with this creature both in my dreams and in reality. 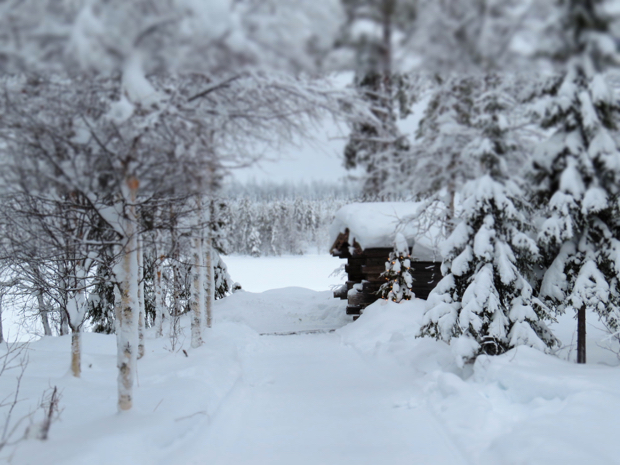 This time, he crept, fluid and snakelike, towards the large wooden door of a traditional Lappish hut. The door opened, and he entered the darkness, leading me towards the fire in the center of the room. There was something indescribably regal about him. I’ve long felt the connection with the crocodile, who in Native American shamanism represents our maternal connection to the Earth. 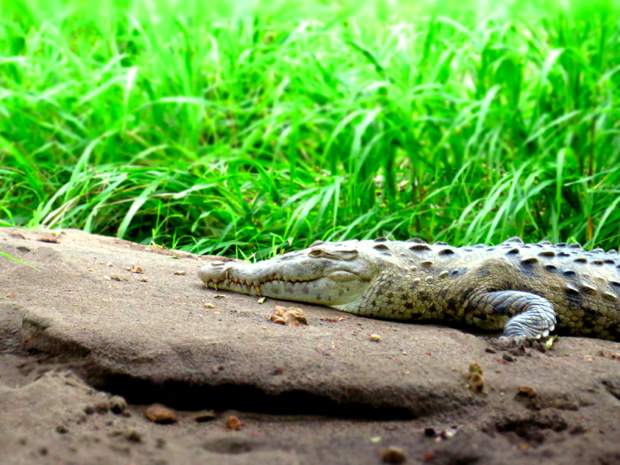 The crocodile has hidden strengths and powers, and his presence indicates the beginning of a new period of growth and regeneration. I’ve simultaneously felt fascinated and terrified by him for years. 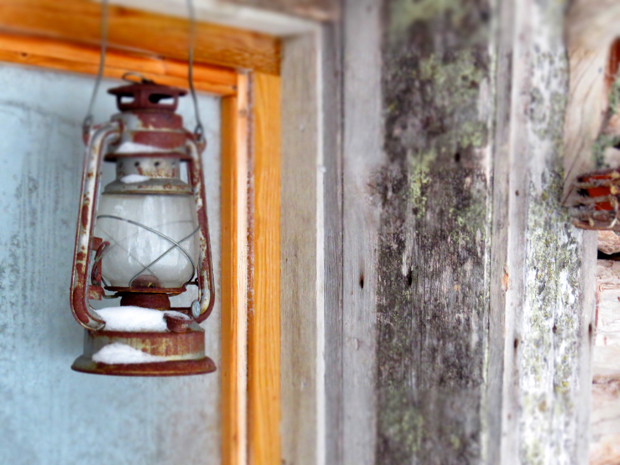 What burned in that fire in the Lappish hut where he brought me today? I wondered. The drumming slowed and I felt a strong chill run through my body. I shivered and watched the images of the bear return and fade. As they did, three truths surfaced from a voice deep within me: one new, one a reminder, and one a confirmation. I’ll keep those truths as my secrets for now. After the ceremony, Kirsi and I stripped off our layers of wool clothing, wrapped ourselves in our robes, and donned our sauna caps, meant to protect our heads from overheating. Katja lit candles in big glass lanterns on the deck that overlooked the lake. They appeared like golden fireflies in an otherwise blue world. 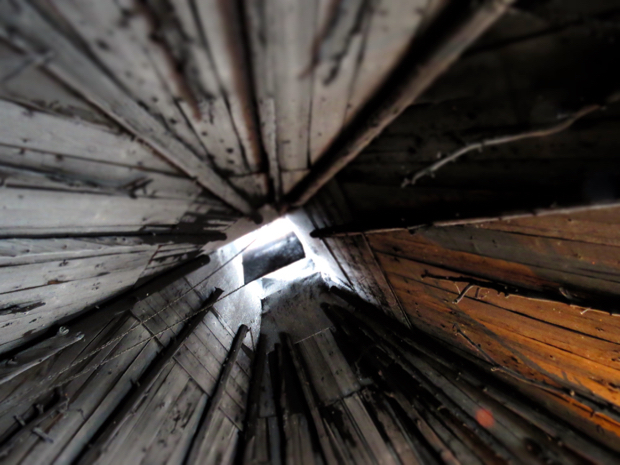 We entered the smoke sauna, and I felt the gentle caress of its heat on my skin. If the electric sauna bites, the smoke sauna kisses. Its warmth, though intense, is indescribably soft and feminine. When my skin became flushed and dripping with sweat, we stepped outside, took off our robes, and put on our wool socks. 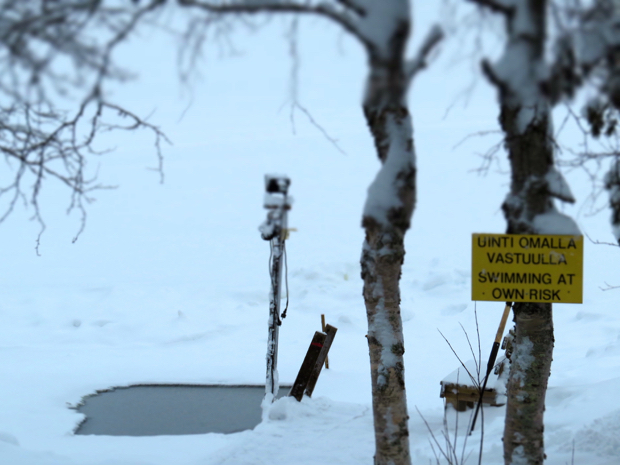 We walked through the snow, completely naked, save for our sauna caps and socks, and made our way to the hole in the ice on the lake. We took turns climbing down the ladder, and submerging ourselves up to our collarbones into the icy water. One intense breath and it was over. Within seconds of stepping out of the water, I felt a warm sensation spread throughout my body. I was completely naked, wet, and walking outside in the snow, yet I didn’t feel cold. I felt warm. Back inside the sauna, Kirsi handed me a branch from a birch tree and suggested that I smack myself with it repeatedly. This traditional method, called vasta, stimulates circulation and allows for muscle relaxation. We dipped our fingers into glass jars of thick black sludge called peat, gathered from swamps around Lapland, and slathered it onto our faces. It tingled and burned. Apparently peat is a deeply cleansing treatment that boosts metabolism and accelerates blood circulation. 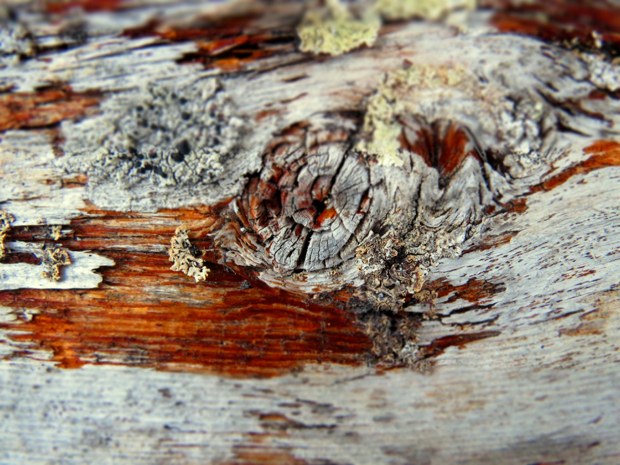 Some believe peat even cures cancer with its detoxifying properties. 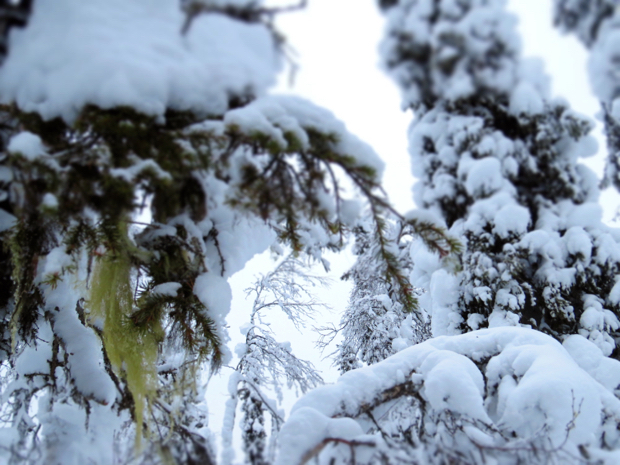 I ceased my daydreaming when I sunk my snowshoe two feet down into the snow slightly off of the trail. I giggled and brought my attention back to the present moment. Right, I wasn’t in the sauna anymore, I was hiking in the snow up to the Holy Hill. 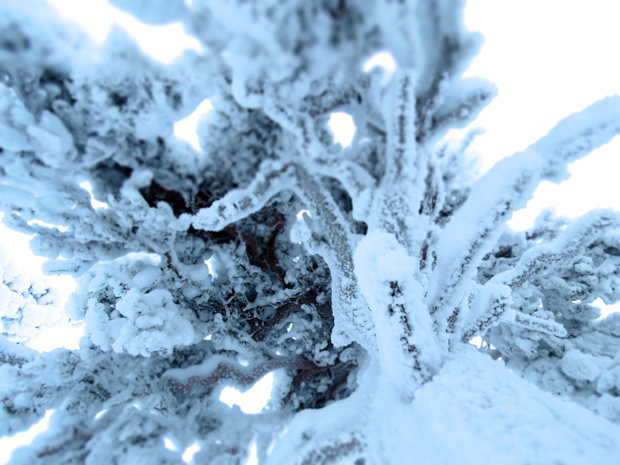 As our elevation increased, the trees began to change form. 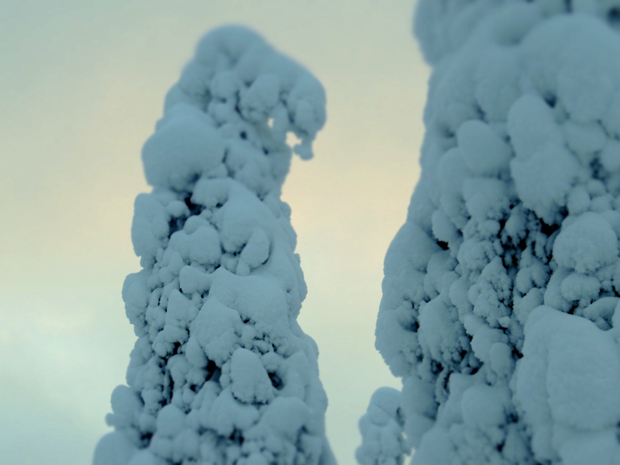 Layers of snow covered them so densely they appeared more like statues than trees. Or perhaps like shy children, hiding under blankets, hoping we wouldn’t notice them as much as they hoped we would. 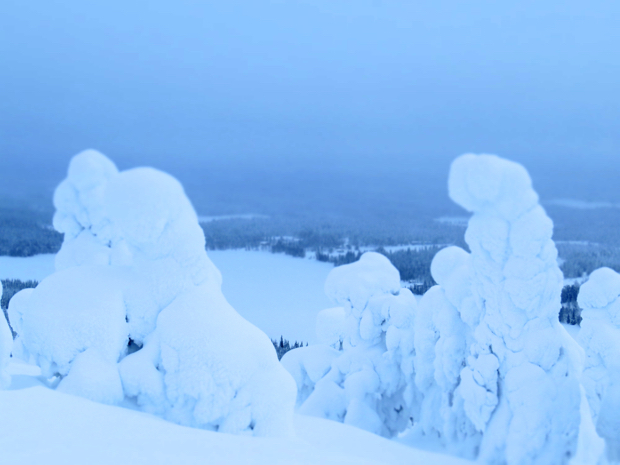 I confirmed that the high forests in Lapland must have been the inspiration for every Dr Seuss tale. “I can see you,” I told them with my eyes. 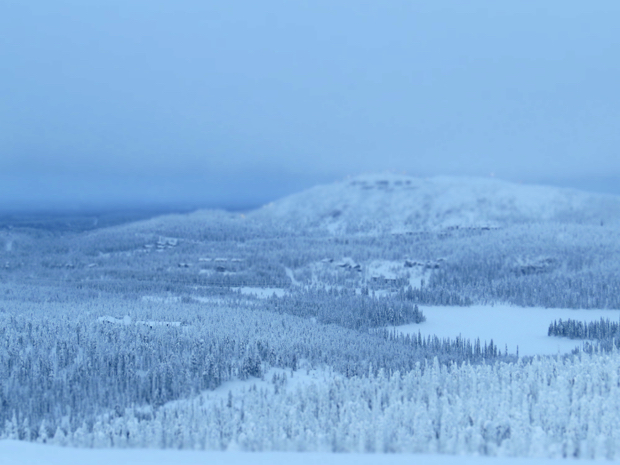 “I love the sound of the forest covered in snow,” Kirsi said. We stopped for a moment and listened. I began to notice the soft whistle of the wind. The delicate rustling of the branches. The more I listened, the more I heard. I considered how in my yoga practice, the less dramatic my movements, the more connected I become with my body. Sound seemed to work the same way. How could I possibly hear a whisper if I’m shouting? The trees thinned, and the expansive surroundings beyond us came into view. I was stunned by the beauty. You could see hundreds of miles into the distance, in every direction, and everything but me and Kirsi appeared a different shade of white. We stood on the mountaintop like two saturated figures in a black and white photo. “Do you want to take a moment of silence?” she asked. I faced the Holy Lake, expansive and amorphous, bleeding into the fields and trees of whiteness, and closed my eyes. I began to breathe deeply and focus only on the sounds that surrounded me. I imagined myself as Usui meditating on the mountaintop, receiving the energy of the universe for the first time. As I relaxed, I began to see the color orange against my eyelids. The more I focused on it, the stronger it became. Eventually it turned red. It surprised me with its intensity, so I opened my eyes to see if the sun had suddenly appeared, causing me to see this bright light. When I opened them, all I saw was the thick, heavy, white sky. Strange. 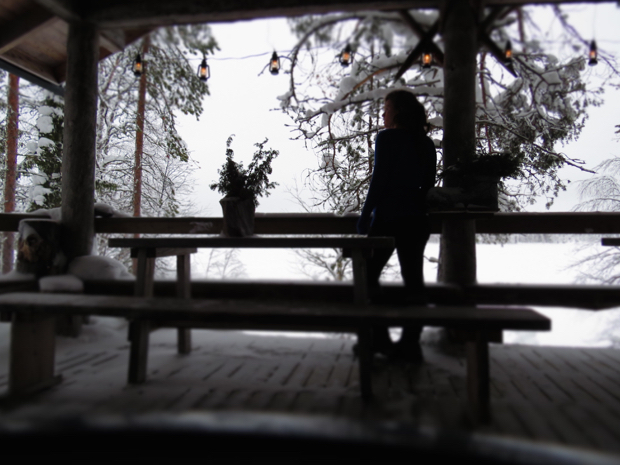 Kirsi and I sat down in the snow and unpacked the picnic Silba packed for us that morning. 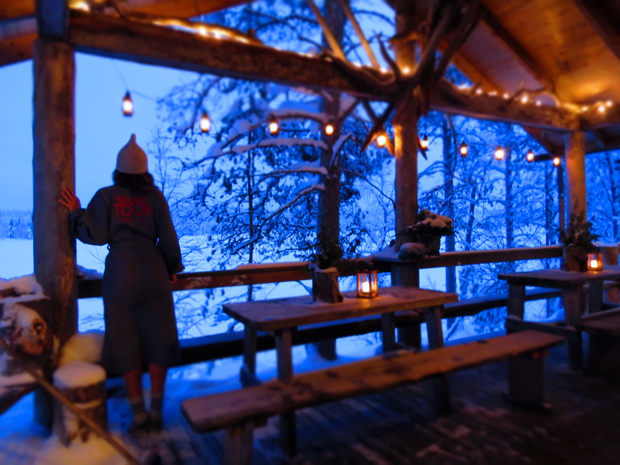 We sipped on hot berry juice out of traditional wooden cups and nibbled on rye bread sandwiches and cardamom buns. The clouds quickly guised the horizon. “We came at just the right time,” I said. As we made our descent, the light began to shift. 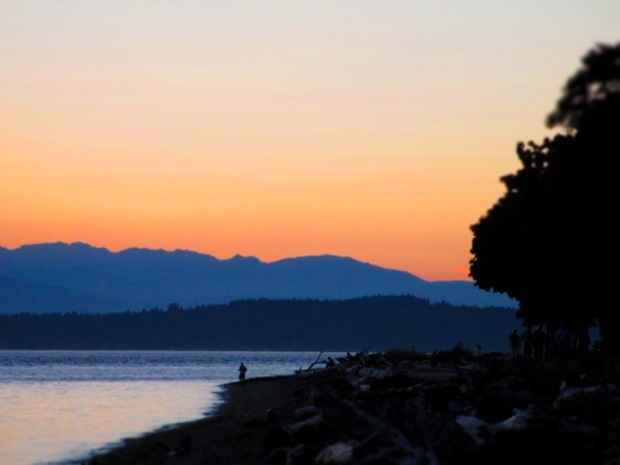 The sky remained opaque, but salmon pink glowed across the horizon. Flecks of snow sparkled in the light like glitter. “It’s amazing how quickly the light changes here,” I said. 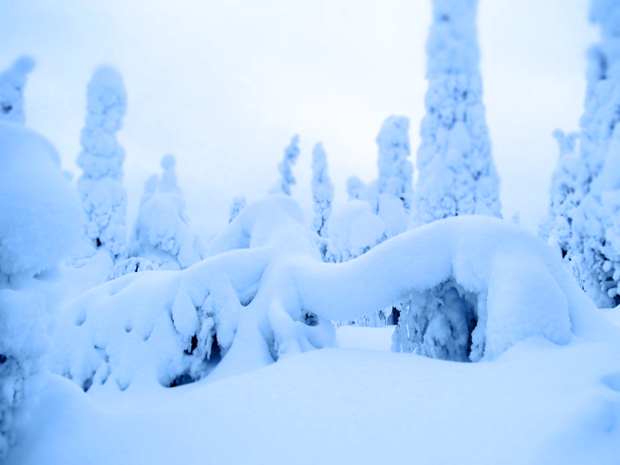 “It’s never the same color twice,” Kirsi nodded. In the distance I saw a lone wooden cottage sitting on the Holy Lake. Just above it the clouds had parted, allowing a glimpse of the sunset, creating an orange circle, guiding me to the structure below. “Look,” I caught Kirsi’s attention and pointed to the light. This experience was created by the wonderful Kirsi from Seasonal Wellness. 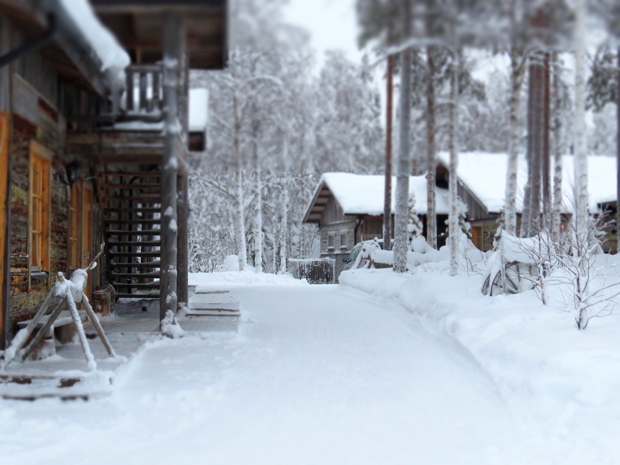 To experience the smoke sauna and stay with the family, get in touch with Isokenkaisten Klubi. This post is stunning – pure art! You never cease to amaze me sweet sister! I love how you write with great respect and openness. And I felt for you, as you told of the meeting with the bear. I’ve met him/her too in my own meditations. I don’t know if your hosts told you of the sacred meaning of the bear in finnish tradition. He/she has many names, which can hard to translate to english, but I’ll do my best to enlighten: Mesikämmen = “Honeypalm”, Metsän Kultainen Kuningas = “The Golden King of the Woods”, Metsä Itse = “The Forest Itself”, Karvalalli = “~Hairy Strong Man”. And these are just a few of over a hundred _known_ synonymes. 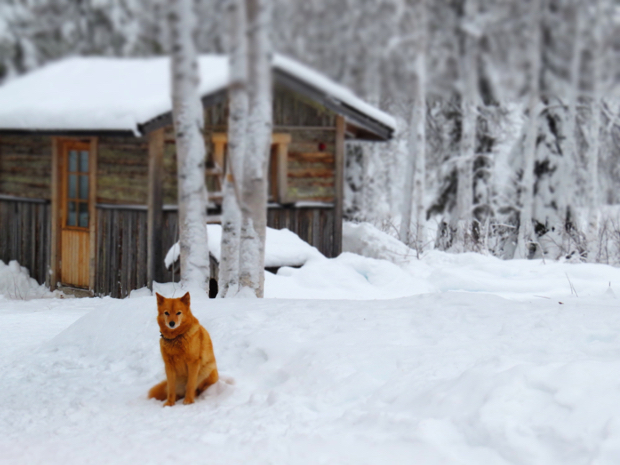 It is a sacred animal, tightly connected to the stories on how finns came to be. We have sometimes been also called: Karhun Kansa, The People of the Bear. Much of this has been lost nowdays, but not all. Thank you for your blog, ms. Willemain, and good journeys! Just started to read your blog. It´s wonderful how you write of your experiences. Little things to big things. 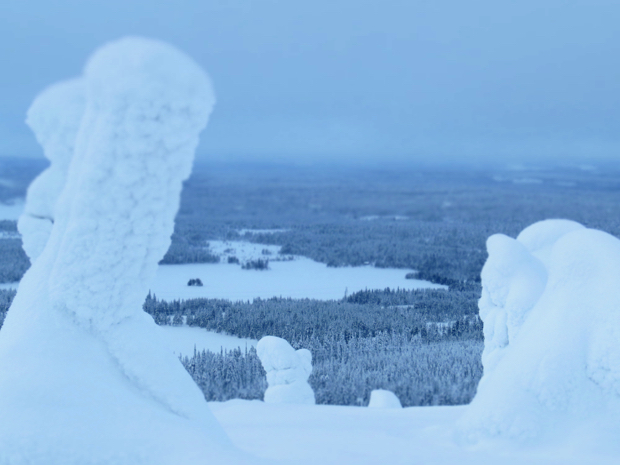 You did meet the spirit of Lapland really. Wish you will come back in the summer to see how everything changes here. Keep up writing stories they are inspiring. Thank you Amy <3 That's what this trip is all about: expanding my happiness. I’ll visit there next week again.